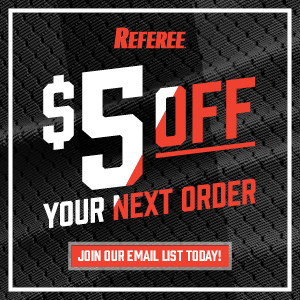 When you join the Referee mailing list you’ll get a $5 coupon you can use immediately on the world’s largest officiating training library. You’ll also periodically receive valuable offers on Training Center products catered to the sports you work and other information about officiating training. We do not sell or give your information to any third party and we promise to limit emails to one per week during your sports seasons and more infrequently during your off-season. You will receive an email shortly after you hit submit that will contain your discount code and instructions for redeeming it.